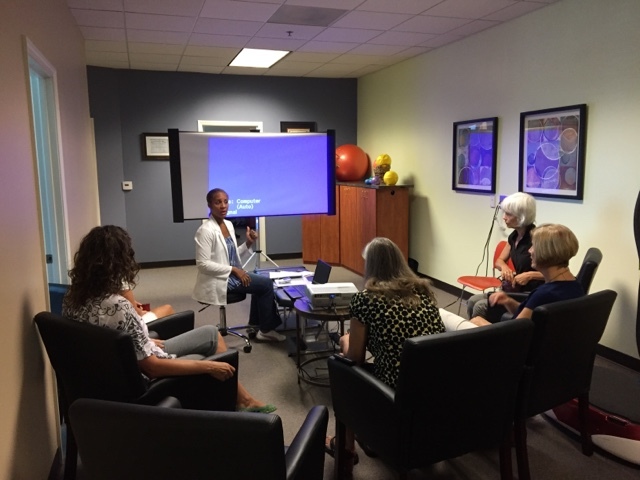 Before I get to write more about my way of treating specific issues and relieving your pain, I need to introduce some of our great workshops at Ballantyne Chiropractic Wellness. We have a great community here in south of Charlotte to learn about and prevent health issues. visited with a great massage therapist Effie Hall and together these ladies introduced the variety of preventive care you can help yourself in taking care of your breasts. We live a world of environmental toxicity and our lymphatic system is struggling to keep up eliminating all thebad stuff in our bodies. You can make a difference if you take control of your life and your habits. We are here to help you and in our office we offer not just structural and functional bodywork but also infrared sauna -sessions and whole body vibration therapy; all an excellent treatments to help lymphatic flow! Our office also utilizes Alpha Stim -therapy, which is FDA proved treatment for anxiety, insomnia, depression and pain. Alpha Stim therapy is a painless way to improve your health without medication and the effects are cumulative. For this treatment you need to consult Dr. Snipes. Our own Dr. Snipes will also talk about how to help yourself when you feel the first symptoms of cold or flu and you just can't afford to stay in bed. Survival Toolkit for cold and flu season -workshop is scheduled Tuesday 9/29 @7pm! Postponed to WED 10/7 @12! And don't forget our weekly Stretching Workhops Wednesdays @11! We will stretch and activate all those muscle that are not used to be stretched. Our concentration is always in the best available posture and finding an upright position without pain. And that, my friends, starts from the feet and ankles. We are looking forward meeting you soon! What do I do in my bodywork?